It’s the last day of my little mid-rotation fall break. Of course I didn’t do all of the things I wanted to do this week: ambitious home cleaning and organization projects, getting up-to-date on my inbox, etc.. But it was good. I gave myself a lot of empty time. I lay around plenty. I cooked some recipes for the blog. I’m not exactly ready for the pace to pick up again, but I’m ready enough, rested enough. While I was resting, I gave a lot of thought to the rhythms of my days. At many points in the last few years I’ve wondered whether I ought to have a job that’s more structured. I have a lot of freedom with my time, which I know is a privilege, but it can be a mixed blessing. My solitude and privacy sometimes give me too much opportunity to dwell on my thoughts. Working from home can make motivation a struggle, and when I’m in a dark mood, there’s no place I have to be that would transport me away from it. No matter how hard I work, I sometimes worry that I’m not doing enough to serve the world around me, or to serve animals. Now I’ve been temporarily flung back into a pace that I remember well from my twenties and early thirties. 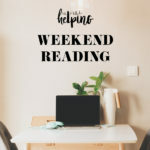 “On” all day, always doing or speaking or processing information, coming home at night to tend to the things I love, this blog included. It’s exhilarating in some ways; I have a sense of purpose, and even if I wanted to brood about something, I wouldn’t really have the time to. But I’ve learned a lot about myself from slowing down, too. It’s given me space in which to think, and thinking has in turn helped me to be more compassionate. In the last few years, I’ve been able to critically examine certain entrenched thought patterns that don’t serve me, and I’ve let myself sit with emotional wounds that have never really healed because I never really admitted they were there. I don’t think I could have done that “work” amid the rushing around of my post-bacc, or the period before that, when I was balancing a full time job with this blog and my science prereqs. On Thursday night, I had some cuddle time with Ashley, who sweetly came to visit me this week. We hadn’t connected like that since we worked on Power Plates, and it was the first time in eight weeks that I actually let myself open up to a friend. I talked about work, about my recent struggles with my body, about trying to date again. When I get busy, I tend to hold everything in, tightly. Talking face-to-face felt like a deep, nourishing breath, made even sweeter because of Ashley’s capacity for generous listening. I don’t really have any conclusions here, but it’s interesting to mull it over. I’m being reminded that some amount of busyness is good for me; it tethers me to the world, gives me a sense of direction, energizes me. Helping people in real time is different from helping them through words, and I know I’ll need more interpersonal engagement, in private practice if not in a clinical setting, when all of this is over. But it’s taken me a lot to embrace slowness, simplicity, and a gentle approach to life, too. Creative work and unstructured time keep me honest with myself and my feelings. I need them, just as I need to feel useful and engaged. With any luck, once this marathon of a DI year is over, I’ll be able to balance the my days in such a way that I can make and do and create while also giving myself space to be, to reflect, and to feel. Wishing you that kind of balance as the week gets underway. 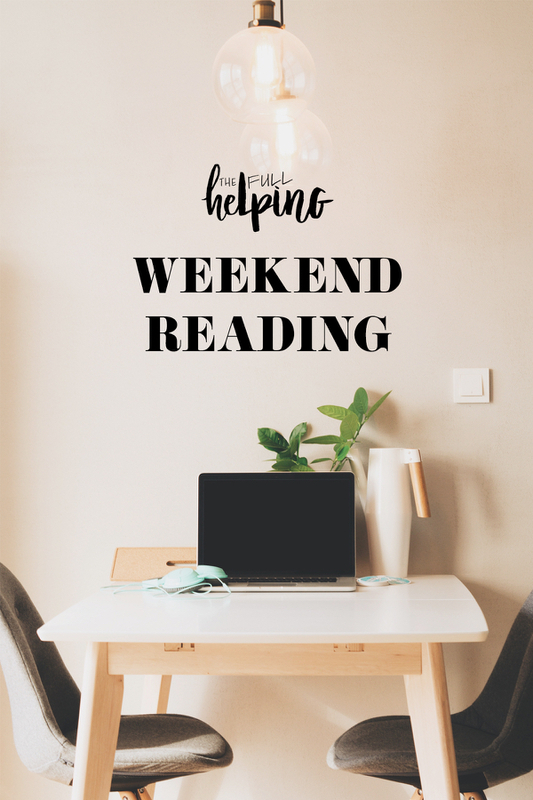 Here are recipes and reads that I’ve been gazing at this weekend. 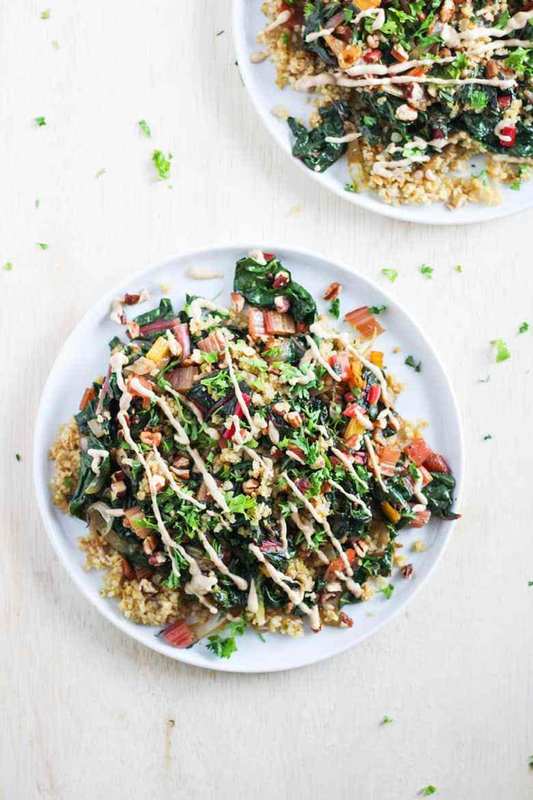 Freekeh is one of my favorite whole grains, and I’m loving this Middle Eastern inspired dish of toasted freekeh, pine nuts, tahini, and chard. 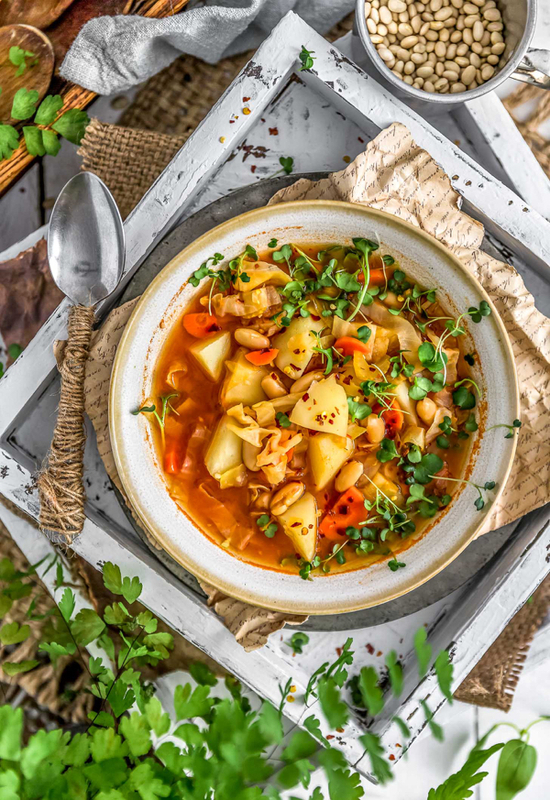 Everything I want for fall: a rustic, hearty, nutritious cabbage and potato stew. 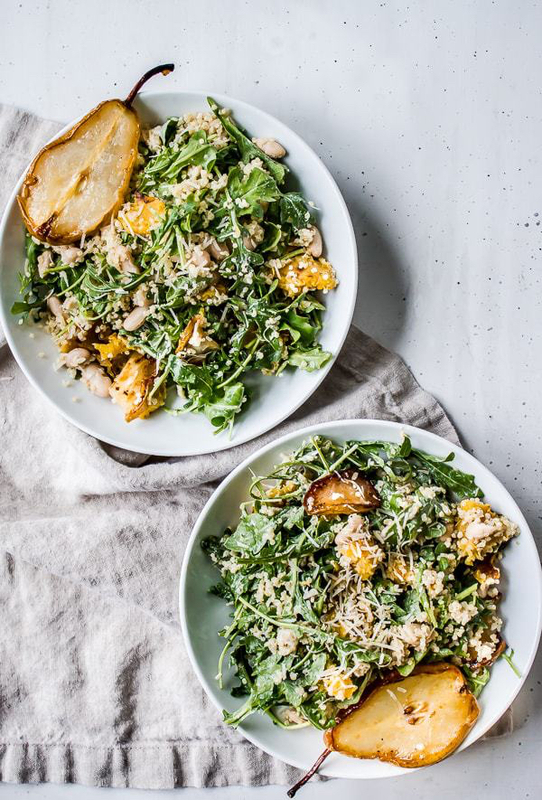 Also in keeping with the season, a beautiful autumnal salad of roasted squash, pear, arugula, quinoa, and cannellini beans. That’s what I call a meal sized salad! 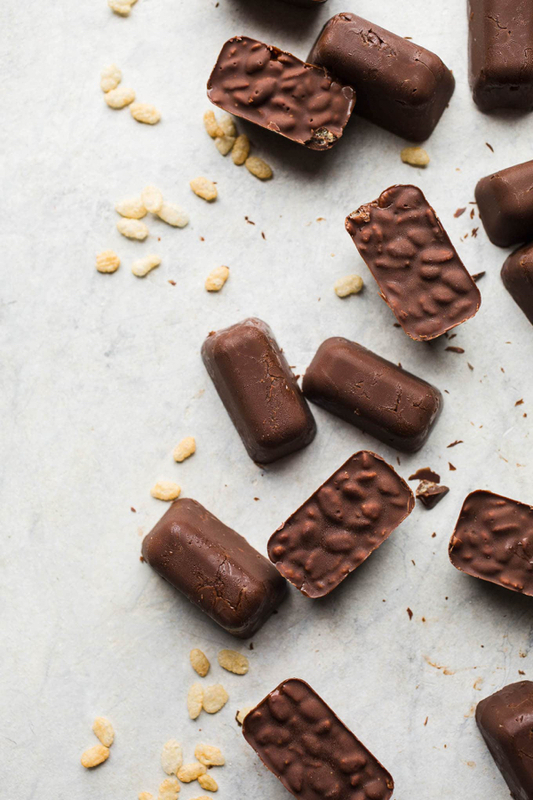 Two homemade vegan goodies for the trick-or-treaters in your life (or just for you). 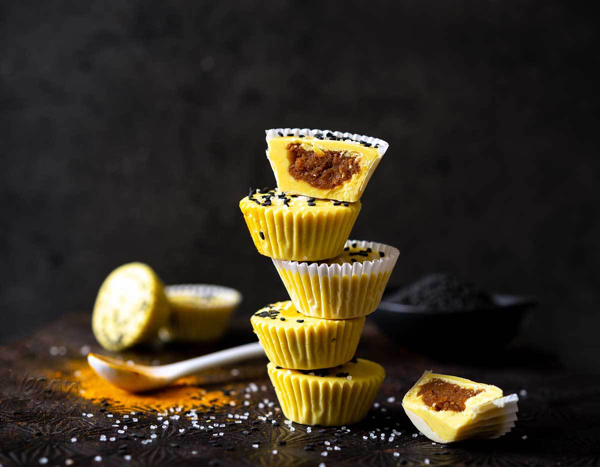 First, Jackie’s white chocolate vegan pumpkin peanut butter cups. I love white chocolate and have never tried a homemade version! Second, how cute are Tessa’s mini crunch bars?! 1. We all read about the dangers of too much screen time, but what is screen addiction, really? 2. Haiku magazine has published a profile of Kelly, a 44-year-old female dolphin at the Atlantis resort in the Bahamas. It’s a saddening read in the context of Kelly’s captivity, incredible to discover the dolphin’s noteworthy personality. The author, Rose Eveleth, ends with some thoughtful considerations of anthropomorphism, sentience, and her own, human response to Kelly. 3. More considerations in the ongoing debate about whether anorexia nervosa is a culturally mediated (and therefore, predominantly modern) disease. My own experience of the illness is that it felt far more intrinsic than culturally mediated, but my guess is that triggers vary widely from person to person. I’d also guess that the current prevalence is owed to a mixture of culturally predisposing factors and genetic susceptibilities. 4. A succinct, yet moving consideration of how mental health professionals should be supported in their grief after a patient dies from suicide. 5. Let’s end on a fun note: twelve totally mind-bending perceptual illusions to stare at again, and again, and again. Early this week, I’ll be sharing a recipe “failure” that I came to embrace as not being a failure at all. You’ll see what I mean. Have a great Sunday, friends. Thank you so much for including our recipe! We truly appreciate your kind words! 🙂 Everything looks absolutely delicious! Nothing I would have rather been doing with my time. So glad I could be there to listen and truly love and cherish our friendship. Oh my, do I FEEL what you’re talking about, in regards to that always “on” with no escape situation. I’ve been feeling fatigued by this more than ever, at the moment, and it’s definitely taking a toll. Unprovoked motivation is hard to come by and my brain just feels overwhelmed so I shut down and do nothing. Today is a little better, but damn! It can be hard. So, I’m sending hugs!